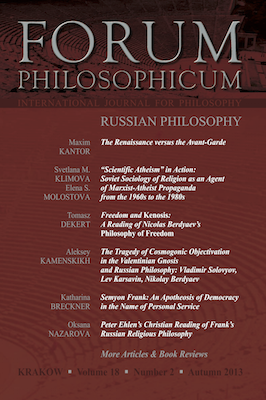 The 2013 Autumn issue of Forum Philosophicum is devoted to Russian Philosophy. The project of this thematic volume grew out of discussions during a conference held in Cracow at Ignatianum on the 27th and 28th of June, 2013, entitled “The Reception of Russian Thought in Europe.” Our Russian colleagues raised, then, a specific concern. They complained that Russian philosophy was not meeting with an appropriate reception in the West, and that commentaries and translations in the West frequently distorted the message of Russian thinkers. The Editorial Board offered, both during the conference and in subsequent announcements in Russian at Internet sites frequented by Russian intellectuals, the possibility of peer-reviewed publication in English in a journal whose editors were in a position to ensure that their ideas would be expressed in English without distortion. As a result, we are able to present our readers with not only several scholarly papers on such Russians philosophers as Semyon Frank, Nikolai Berdayev, and Vladimir Solovyov, but also two texts enabling Western readers to become somewhat acquainted with contemporary Russian thought, and to learn in more detail about the conditions in which philosophy was being practiced in the Russian-speaking world until recently. The first such text is an essay by Maxim Kantor, the renowned contemporary Russian intellectual, painter, and philosopher. His proposition that renaissance and avant-garde are two recurrent but opposing phenomena within Western art and philosophy exemplifies contemporary Russian cultural criticism, in which political conservatism and a dialectical vision of history are combined in a manner that has no parallels in the West. It is followed by a historical study (whose complete text we publish in open access) by Svetlana M. Klimova and Elena S. Molostova, based on previously unpublished materials of the Institute of Scientific Atheism of the Academy of Social Sciences of the Central Committee of the Communist Party of the Soviet Union. The study shows how Marxist philosophy was viewed, and used primarily as a basis for the practice of social transformation, being focused as it was on eradicating from human minds any form of faith or religion.